K ronomyth 1.8: HEIRING AID. A year after Live Aid, Midge Ure and a smaller, star-studded cast returned to Wembley Arena to celebrate the 10th anniversary of (and raise money for) the Prince’s Trust Charity. 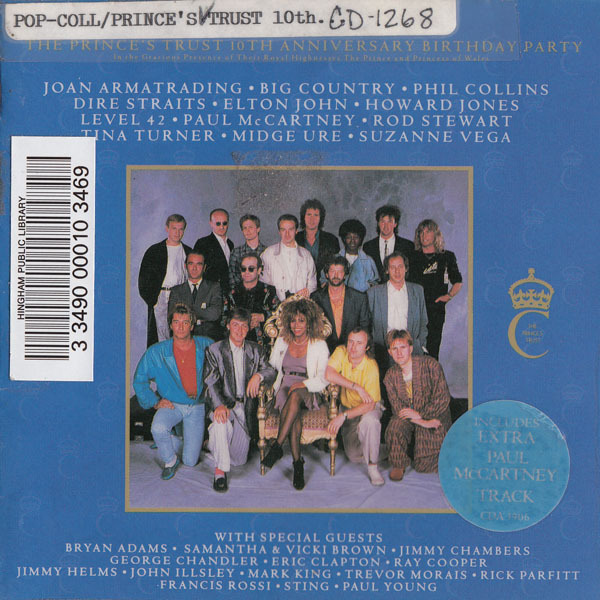 This disc highlights the biggest stars from the concert, including bits by Ure, Dire Straits, Phil Collins, Tina Turner, Elton John, Rod Stewart and Sir Macca himself. 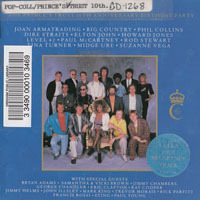 As concert discs go, this one is pretty tepid; so was Live Aid for that matter. Performers don’t get a chance to set up the acoustics the way they’d like, they don’t get a chance to warm up, in some cases they’re playing with ad hoc bands (albeit with very good players), all of it conspiring toward mediocrity. The sound engineering on this one isn’t particularly good either; a lot of sound seeps out and what remains sounds thin. So if you weren’t invited to the original party, Highlights is no magic ticket. Some of the performances are good, most of them fall flat. Honestly, if you’re interested in hearing an oldies revue like this, pick up one of Ringo’s All-Starr albums. Speaking of The Beatles, McCartney does a decent version of “Get Back” with Tina taking a few lines and a short, spirited revival of “Long Tall Sally.” (The elpee version featured a bonus single with Sally and I Saw Her Standing There.) As someone who still isn’t completely sold on the merits of live albums, I’m rarely charitably disposed to these save the worldwind tours. The Trust’s Tenth is a great cast for a good cause, but a good live album it ain’t.